UDM Downloads > Phantom Burner! Phantom Burner is a Blu-ray BD-RE/DVD+RW/DVD-RAM/CD-R/BD-ROM/DVD-ROM/CD-ROM burner drive. 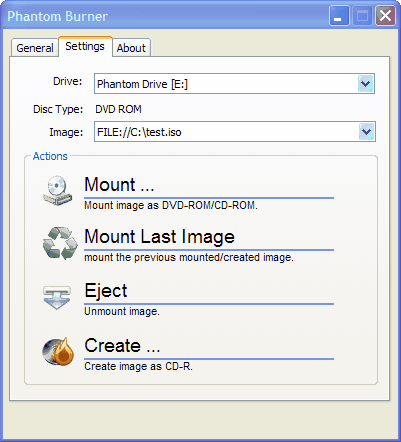 It not only allows you to mount disc image files as virtual CD, DVD or BD (Blu-ray)discs, but also let you create disc image files by burn to the virtual BD/DVD/CD drive, from using any disc burning software. Many people understand the benefits of using disc image files (like ISO) instead of real optical discs. It is cheaper, faster, and you don't need to worry about scratches or the storage and organization of discs. However, not all burning software supports disc image file creation. Even if it does, most likely it only supports data discs. Very few burning software support disc images for audio CD's. Use Phantom Burner instead. It is a virtual burner, and allows you to create disc images from any burning software, including Blu-ray, DVD, data CD and audio CD. By supporting standard SCSI commands, it is compatible with most burning software, whether it is Nero or Roxio, Yahoo Music, Rhapsody, Windows Media Player or iTunes, myDVD or WinDVD Creator. It is extremely easy to use. It appears as a hardware burner in your Windows Explorer. Right click on the icon to mount a BD/DVD/CD image or to create a new image. There is nothing special for you to do in the burning software, except selecting Phantom Burner as the drive. Compatible with Nero Ultra, Roxio Easy Media Creator, Sonic RecordNow, WMP, iTunes, RealPlayer, Rhapsody, Yahoo Music, WinDVD Creator, Power2Go and more, too many to list. Supports 32-bit XP and Vista. No Spyware. 64-bit support coming soon.